The powder-free gloves are more resilient to splitting or ripping, during donning and through use. The gloves have rolled cuffs for added performance. Ideal for use in a controlled environment, these sterile, powder-free latex gloves provide protection and great dexterity and comfort to the user. They are low protein, disposable and designed for use on one patient only. Gloves may be changed during the course of a prolonged procedure for safety. The latex surgical gloves are tear-resistant, to ensure increased hygiene control, while also providing the wearer with excellent flexibility and durability. The gloves can be donned quickly and efficiently, thanks to the beaded, tear- resistant cuffs. Mediskin non-Powdered Latex Gloves are bio-degradable and environmentally friendly. 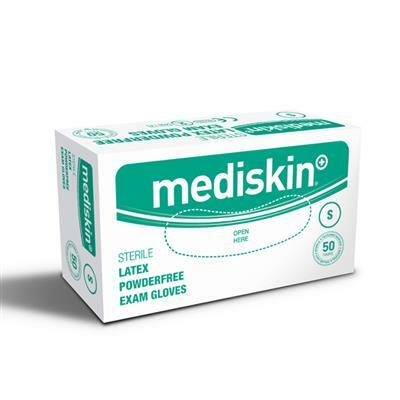 Mediskin latex gloves are a perfect fit for jobs requiring a non-powdered exam glove. Made of premium latex for greater comfort, this latex glove is best for medical, dental, and general-purpose applications. These latex gloves are also suitable for home use.